"...We purchased two of your beds ...and found them durably constructed and maintenance free and a great relief to my osteoarthritis. We highly recommend your products and wonder how we ever lived without them." Ask about the Supernal Hi-Low Bed! 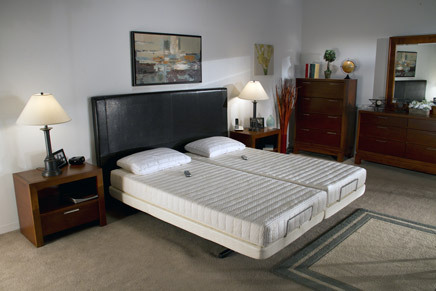 American Massage Products is proud to announce our latest line of adjustable beds - The All New Supernal Sleep System. Watch the video above and then contact us at 800-475-8122 to learn more. The American Massage Products, Heavy Duty Supernal Adjustable Massage Bed has a massage system that allows your body to naturally relax. The therapy that you receive from your American Massage Products, Adjustable Bed with Massage relieves chronic annoying pain in your back or hips. It eases the stiffness and pain in shoulders, neck or arms, and is also proven to reduce chronic pain and inflammation of arthritis and aching muscles or joints. Sleep comfortably in this affordable electric adjustable bed. Get back to having a life without pain! Copyright © 2014 American Massage Products, Inc. All Rights Reserved.